The Philippine Chairmanship of ASEAN in 2017 is an opportune time to revive the National Branding Council proposal made by the Management Association of the Philippines (MAP) in 20121 to build the international image and reputation of the country. Nation Branding is an important tool in managing a country’s identity across the globe2 forming part of public diplomacy (PD). PD covers aspects such as inducing appeal by influencing public opinion using information, education and culture. This has long been strategically employed by the Department of Foreign Affairs (DFA). Nation branding, on the other hand, is a related concept but not new to Philippine government agencies such as the Department of Tourism and the Department of Trade and Industry. Nation branding, however, entails knowing the country—its people, products, and how it is perceived by other publics. Other Asian countries such as South Korea and Japan have adopted national branding to enhance their soft power. 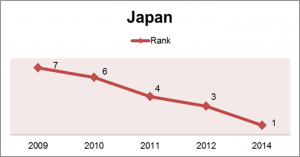 An indicator of their success is the latest results of an international perception survey, in which these two nation brands have been topping the global charts.3 Based on available data, Japan, in particular, has increasingly improved its standing since 2009. But what lessons can the Philippines learn from the South Korean and Japanese experiences in institutionalizing a National Branding Council? South Korea and Japan as models? Aimed at improving the image and reputation of Japan, the Japan Brand Working Group was established by the Intellectual Property Policy Headquarters in 2004 to set the directions for the nation branding initiatives of the country.8 Its mission was to carry out in-depth discussions on three Japanese cultural aspects – food, local brands and fashion.9 The Japan Brand Working Group (JBWG), is a body solely responsible for setting the policies, but the execution of plans was left to various government agencies and organizations in the private sector. Can we do it? The environment now appears to be more conducive and strategic for nation branding and public diplomacy programs. The Philippine hosting of APEC was an avenue by which nation branding could have been useful. The Philippine Chairmanship of ASEAN in 2017 provides another opportunity to showcase the Philippines, its culture and products. The prospect of adopting strategies for nation branding becomes less difficult with the increasing use of the social media. However, one likely consequence of taking up this recommendation is the creation of another institution: a Philippine National Branding Council. The Council could comprise of representatives from the National Competitiveness Council, Department of Foreign Affairs, Department of Tourism, Department of Trade and Industry, National Commission for the Culture and the Arts, Department of Education, local government units and key partners in the private sector. However, establishing a National Branding Council is no simple task. Support from key stakeholders – the government, the business sector and the public must be on board on this project. And most importantly, financial support from the government will be crucial in the establishment of this council. Once the council has been set up, the challenge is maintaining smooth coordination between and among the government and private sectors. Another issue is harnessing the power of the Philippine diaspora around the world. But the most important challenge is having clear branding image objectives – what is it for? Is it to attract investments? Is it to increase competitiveness of the country’s exports? Is it for tourism or destination branding? Is it to become an education hub? In other words, the key objectives including messages must be clearly defined. With numerous regional activities in the horizon, a National Branding Council will be timely and strategic. The DFA can play a role in nation branding efforts by broadening the reach of nation brand promotions through its Foreign Service Posts. Central to all this is the cooperation among agencies involved and the government must be proactive in dealing with negative publicities. The private sector and the Filipinos abroad are significant actors whose active participation can assist the National Branding Council’s projects. After all, projecting a good nation brand – making it global, is a coordinated national effort. CIRSS Commentaries is a regular short publication of the Center for International Relations and Strategic Studies (CIRSS) of the Foreign Service Institute (FSI) focusing on the latest regional and global developments and issues. 1 Management Association of the Philippines, “National Branding Committee.” http://map.org.ph/programs/map/2013-01-24-03-01-31/national-branding (accessed 3 May 2016). 2 Gyorgy Szondi, “Public Diplomacy and Nation Branding: Conceptual Similarities and Differences.” Discussion Papers in Diplomacy No. 112 (November 2008): 4-5, http://www.clingendael.nl/sites/default/files/20081022_pap_in_dip_nation_branding.pdf (accessed 3 May 2016). 3 FutureBrand, “Country Brand Index 2014-2015.” http://www.mumbrella.asia/content/uploads/2014/11/CountryBrandIndex2014.pdf (accessed 3 May 2016). 4 Olivia Ih-Prost and Antoine Bondaz, “South Korea Trying to Improve its Nation Brand,” Korea Analysis, July 2014, http://www.centreasia.eu/sites/default/files/publications_pdf/note_ka1_south_korea_trying_to_improve_its_nation_brand.pdf (accessed 3 May 2016). 5 Dinnie, Keith, “More than Tourism: The Challenges of Nation Branding in Asia,” Global Asia Vol. 7 No.3 (Fall 2012): 13-17. https://www.globalasia.org/wp-content/uploads/2012/09/90.pdf (accessed 3 May 2016). 6 Regina Kim, “South Korean Cultural Diplomacy and Efforts to Promote the ROK’s Brand Image in the United States and Around the World,” Standford Journal of East Asian Affairs Vol. 11 No. 1 (Summer 2012): 124-134. https://web.stanford.edu/group/sjeaa/journal111/Korea2.pdf (accessed 3 May 2016). 8 Dinnie, Keith, Nation Branding: Concepts, Issues, Practice (New York: Routledge Taylor and Francis Group, 2008):211, http://books.google.com.ph/books?id=6P0JBAAAQBAJ&lpg=PA212&ots=9toCh_efkP&dq=japan%20brand%20working%20group&pg=PA211#v=onepage&q=japan%20brand%20working%20group&f=false (accessed 3 May 2016).